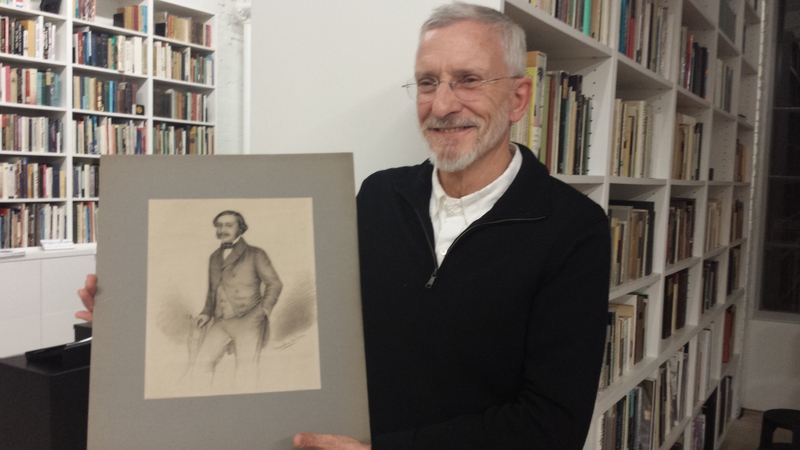 The jaunty fellow pictured below has returned to his family — to me — after an absence of more than a century and a half. He was drawn in charcoal and pencil by my great-great grandmother, Amalia Höber, née Oppenheim. Based on his clothing and what I know about Amalia, I believe Amalia drew him between 1840 and 1850. I wonder where he traveled during the strife and wars in Europe since then — the Franco-Prussian War, World Wars I and II and the Cold War. What I do know is that he popped up for sale over the internet recently, and my dear friend Achim in Dresden spotted him. The seller, a small-scale dealer in drawings and paintings living in Bonn, bought him at auction in southern Germany. She had little information about his origins, but Amalia’s signature on the drawing is perfectly clear. Given the unusual name and the period in which it was drawn, I have no doubt of its authenticity. I do wish I knew who the man in the drawing is. 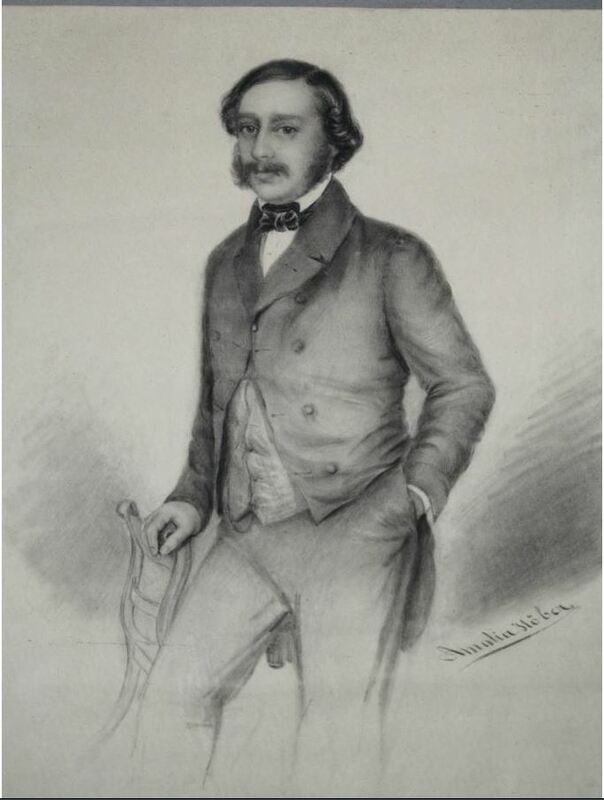 Amalia Höber, drawing of a young man in a tailcoat, c. 1840-1850 , charcoal on paper, 32×26 cm (12 1/2″ x 10 1/4″). Amalia (1817-1895) was the daughter of Simon Daniel Oppenheim, a jeweler and financier from Hanau, near Frankfurt. She married my great-great grandfather Eduard in 1839. He died ten years later at the young age of 45, leaving the Amalia with three sons and two daughters, all under the age of ten. Eduard left her a fair sum of money, however, and her father and brothers also helped to support her. Portraits of Eduard Höber and Amalia Oppenheim Höber around the time of their marriage in 1839. 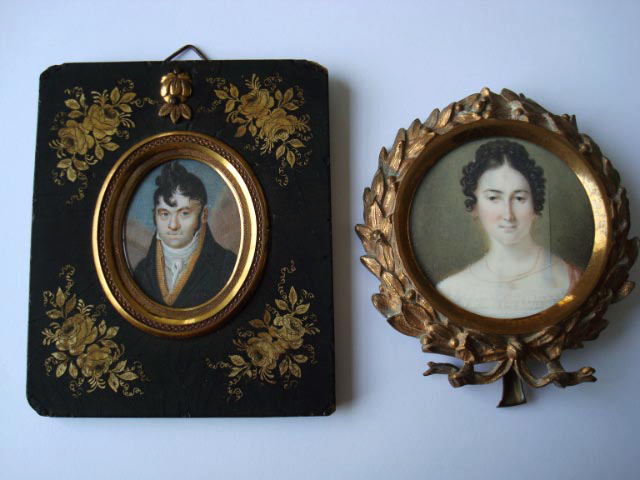 Miniature paintings by their daughter, Marie, copied from larger oil portraits (now lost) in the 1860s. Until I saw this excellent drawing of the young man, I didn’t know that Amalia was an artist. I knew, however, that her uncle Moritz Daniel Oppenheim was a famous painter and that her daughter, Marie Höber, was an accomplished miniaturist. The predilection for portraiture seems to have run in the family. The drawing of the young man in the tailcoat was initially offered for sale at more than I could pay. After some email exchanges facilitated by my friend Achim, however, we were able to agree on a manageable price. You may imagine that the day the package containing Amalia’s drawing arrived here in Philadelphia recently was pretty moving. I am delighted to have the young man back home.